England's strategy for teaching children to read could be overloading them with superfluous words, researchers have suggested. The strategy recommends teaching them to recognise 150 words initially. An ongoing study at the university of Warwick says 100 will do to read most written English, including books intended for adults. Far fewer phonic skills than in the official strategy were needed to understand various letter combinations. Warwick researchers Jonathan Solity and Janet Vousden analysed a range of books including adult fiction and non-fiction, and two popular reading schemes. 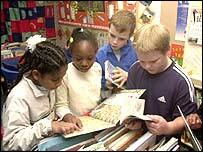 By learning 100 key words, children found they could understand books designed for both youngsters and adults. Being able to recognise the extra 50 most-used words, as recommended by the literacy strategy for the first two years of schooling, meant children gained an understanding of about 2% more of the texts. Dr Solity told the BBC News website that his Early Reading Research project had reduced the incidence of children having problems with reading from about 20-25% to less than 2%. It involved both phonics - the sound of letters and letter combinations, and "sight vocabulary" - recognising whole words from the letters in them. He said written English appeared to have lots of irregular words, but in fact when analysed a significant proportion of it was highly regular and could be taught through a very small number of skills. There are about 44 phonemes - sounds. But these are represented by a rather larger number of letter groupings. For example, an "ee" sound might be "ee" or "ea" or "ie". He said the national literacy strategy required 108 of these, some said there were 195 and the maximum possible number of associations between sounds and the written representations of them had been calculated at 461. But his approach meant children had to learn only 61. "So we teach half the number but the principle is the same: they enable children to read somewhere in the region of 70% of all the phonically regular words in the adult literature," he said. The core 100 words accounted for 53% of all the words in a database of 850,000 words analysed in the adult texts. And just 16 words accounted for a quarter of all the words. "If you teach more and more of them children end up being confused - and they are just redundant." For example, the letter combination "dge", as in "fridge", cropped up only 11 times in the 850,000 words, he said. The letters "ie" could represent no fewer than nine different sounds. They occurred 267 times in the 850,000 words but because they could be nine different sounds, a child was left working out which "through nothing other than trial and error". So the Warwick scheme focused on the most frequently occurring. A key feature is what he calls "phonic self-correcting". For example, if a child is taught that the letters "ea" have an "ee" sound, they will initially trip over the sentence "I went to the shop to buy a loaf of bread" - pronouncing it "breed". But they know that doesn't make sense, so quickly correct it. He said this was not "a return to the old days" - give children books and they would learn to read. "It is underpinned by careful teaching. They are not encouraged to guess or look at picture clues, but to use their skills," he said. Dr Solity said the findings were important not only for children but also for adults who struggled to read - not least because they were put off using children's reading schemes. The researchers could say to them, "show us what you want to read and we'll give you the skills you need," he said.